Ah, the season of doilies and chalk candy, explosions of pink-and-red and dyed, overpriced flowers. As much Valentines Day might be fodder for cynics and card companies, like anything, it is what you make it. And if you happen to be like me, and secretly love the idea of Valentines Day, but dread trying to come up with a fresh, non-cliche idea for how to celebrate, never fear. I offer my top 7 most unusual Valentine dates, all designed to restore some originality to the day. After all, any excuse to do something fun with the one you love is never a bad thing. 1. Want an evening of classic romance? When was the last time you went out dancing to the sounds of the big bands? 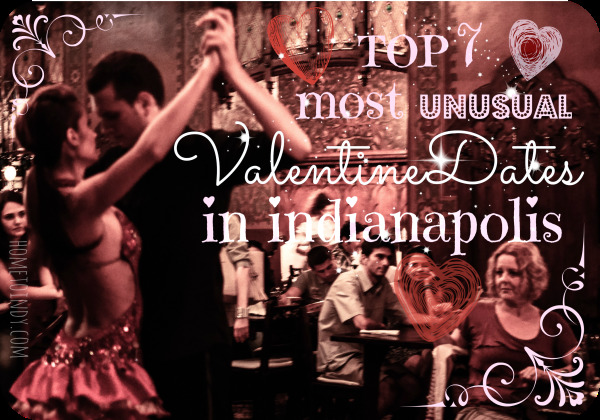 On the 14th of Feburary, you can't go wrong with the Friday Night Swing Dance at the Fountain Square Theatre. They do this every second and fourth Friday of the month which, luckily for us, falls on Valentine’s Day this year. Don't dance, you say? Well, never fear. There is a lesson from 7:30 to 8:30 and then open floor with the band from 8:30-11 p.m. Gentlemen, even if you don't feel like you have a shred of an inner Fred Astair to hold you in good stead, I can promise that even the suggestion of taking your sweetheart out swing dancing for Valentines day will earn you so many cupid-points, she won't care if you step on her feet or fall on your face. To her, you will be the very epitome of a suave, heroic valentine, one which she will swoon to be on the arm of. Trust me. Oh, and if it helps, New Day Meadery across the street has honey-wine tastings which are amazing. Trust me, you’ll be all “Fred and Ginger” before you know it. Cost: $35 for a wine tasting and admission for two to lessons and dancing. 3. Wanting something a little more cultured? Try a performance by the Indianapolis Symphony Orchestra at the central library's Clowes Auditorium. This event is also on Saturday, at 2 p.m., but maybe you make a weekend of it and combine some things. Maybe mix and match. Can you imagine surprising the object of your affection with a whole weekend, planned full of interesting and unique romantic events? So many points for you. I'm telling you. Cost: Free! 4. Here’s an option that’s a little less obvious, but still really fun. Try Saturday night's Karneval costume party at the Rathskeller. Emulating the age old tradition of masked balls in the German city of Cologne, spend the evening enjoying polka music, dancing, food and beer. The theme is Sweethearts and Lovers and there is a prize for the best costume! This event features the music of a band called Polkamotion. Come on, now, you can't say that wouldn't be completely different and a lot of fun. Cost: $30 for two in advance or $40 at the door. Beer and food are additional. 5. So maybe you’re frustrated by the thought that dinner and a movie is cliche or trite or tired, because honest-to-God, that is your favorite thing to do. Well, that’s great! Here is a way to make even that most classic of dates something interesting and special! How about dinner and then a movie set to the live music of the Indianapolis Chamber Orchestra? The IMA's 2014 Winter Nights Film Series has just such a thing. They'll be showing the 1926 classic The Strong Man, accompanied by the ICO playing the score. You could partake of dinner at the cafe, drinks at the concession stand and this wonderful old movie. Films at the IMA are a fun experience, even without the added romance of the orchestra. If dinner and a movie is just your speed but you want something with just a little extra romantic flair, this might be the pick for you. Cost: $60 for two, non-member price. Food and drink are additional. 7. This is really the ultimate unusual valentine. Whether you've been married a while, or have been planning on it, but simply can't wait another day to wed, On Friday, February 14th at 11 a.m. you can go to City Market, downtown, where Mayor Greg Ballard will be performing a group wedding ceremony. For anyone wishing to wed or renew their vows, there will be music, entertainment and light refreshments. This event is free and open to the public, so even if you don't plan to participate, you can always go and bask in the wedding glow. There they are. Hopefully these ideas point you in the direction of an unforgettable time where you focus on the great blessing of having the one you love at your side. At the very least, I hope these get the idea wheel turning for your own perfect, unique date. If you have other ideas, you should share them in the comments section! I'd love to hear what interesting things around Indy you came up with, this year. Might be that you'll see me at at least one of these events, enjoying the company of my favorite person in the world. Happy Valentines Day!